COMMANDER OF THE GALACTIC FEDERATION OF LIGHT SOCIETY. Namaste, I send you love and light and so many blessings from the Archangelic Realms who love you so much. Please read this message below as it is important for us all. The greater the universal games are revealed to us, the greater the importance is shown for us to begin to listen to Divine who is here to bring us into the love frequencies. We need to stand in our love and forgiveness as we were all involved in the universal game, in one way or another. 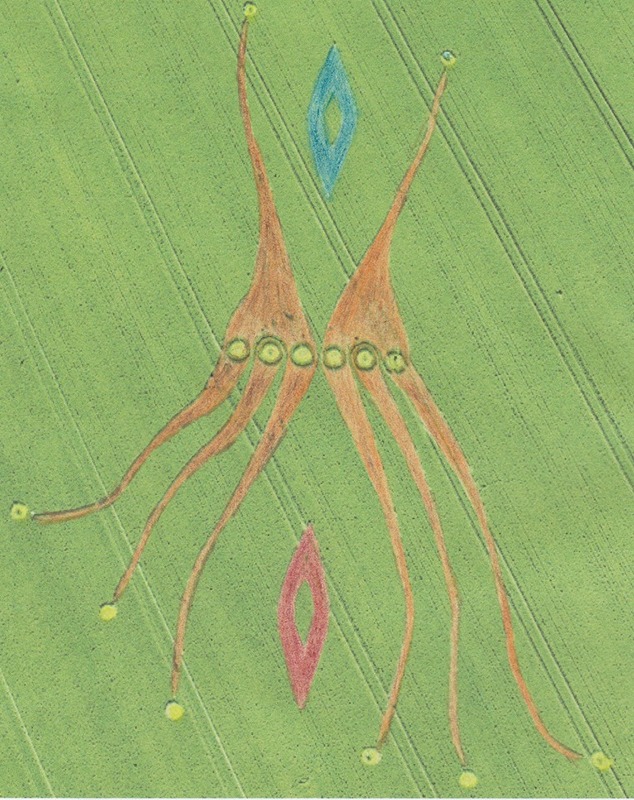 Here in this image of the crop circle, at first glance you might think they are hands. You may think of slimy hands, perhaps reptilian hands, which it very much looks like. Looking into it deeper with the explanation of HALISARIUS, GALACTIC FEDERATION OF LIGHT COMMANDER, we see a different picture, and the explanation of it once again refers to the universal game. Here you can see two elements; the red star element and the blue star element. According to the teachings of HALISARIUS and CAEAYARON (KRYON) (transmitted by Suzanna Maria Emmanuel) , these two elements were incredibly important to the universe as one element, the blue element, was creating new life force energy and it was in the love frequencies. The other, the red element, desired to investigate all frequencies and desired the freedom and independence to create. Once the battles were created in the red universes, there came to be forces in the universe who desired to overtake the blue element, as the blue element had the key of life within it. Whoever held the key, or could find the key, was to have ‘total immortality,’ and also ‘total power,’ over the Divine Love Energies. This ‘key’ was deeply hidden in the universe and it would not be revealed where this ‘key’ was kept until the days of the great revelation, which is now, the days we are living in. Because the blue element had great creator life source and it was desirable to the red element universes, the red element forces began to create a field around the blue universes to allow the blue universe life-source to be tapped into for the opposing universes, and therefore the blue universes were drained of its life-source energy. As a result the blue universes became weaker which allowed the takeover to become easier. This ‘field’ you can see in the image with the top skinny ‘hands’ surrounding the blue element as the other opposing forces had imprisoned the blue element. The yellow centres at the knuckles of the ‘fingers’ work like very large containers where the energy of the blue universes was stored, and slowly this is how it was transferred to the red universes to be used for their greater power. The red universes used it to create their technology, their own universes, their own beings and so on. The battles were great. Huge battles in the red universes were created, and the fight for survival was on. There were protective measures put into place, so that even though so much was destroyed, the Divine Elements could never be fully destroyed. These secret elements were placed in a very secret space allowing all to become recovered should the destruction become so great, which it sadly did. The difference between the blue universal energy and red universal energy was so huge that the energy of the blue universes could not possibly be received in the red universes without machines to slowly transfer the blue energy to the red energy which was a much lower frequency. These machines worked in a similar way like a water dam does. Slowly it allowed the energy to come through to the red universes, instead of barrelling it through, for that would have destroyed the red universes as the blue universal love creator force was mighty and thus highly desirable. The yellow circles at the top of the blue element depict syphoning machines to take energies from the blue universes and it was then taken to the centre of the ‘hand’ to the ‘dam’ to be stored and slowly brought down in frequencies ready to be used by the red universes. The yellow circles at the bottom of the ‘finger like’ hands act as energy storage vessels filled with the life force energy taken from the blue universes. This was able to be tapped into to create more planets with technology to destroy and defend. Please read this message below from HALISARIUS as he desires to bring this to you on this matter. Greetings, I AM HALISARIUS, CHIEF LEADER OF THE STAR DIMENSIONS OF LOVE, CHIEF LEADER OF THE GALACTIC FEDERATION OF LIGHT SOCIETY AND CHIEF LEADER OF OUR PLEIADIAN REALMS. I say to you greetings and I bring peace and love to you always. I am transmitting this message through my Star Light Grid Programmer who works with Divine, SOVEREIGN LORD EMMANUEL THE GREAT, CAEAYARON, who is the Great Aligner to bring all things to the love and the light, and she works with my Being, HALISARIUS, also. We bring to you the great love. We speak to you here as a collective of Galactic Federation of Light Members, as we need to speak to you, to awaken you, to allow you to rise into the love star beings once again. Once upon a time, all was in the love before the dimensional games began to be played. As I am directing this message through this channel, I ask you to observe, to feel into the game, into the greatest universal story and into this message from the stars, which you call a crop circle. It is an apt time to discuss this message as all is becoming aligned to the love dimensions, and it is time for you to awaken to the games played, like I stated in this message before. The power, the rulership over all of life was always desired by beings who were not beings in the love. They desired the great Divine Power to construct their own universes, not in the love. Greed evolved out of those universes. The greedy created enormous pain and suffering to feed themselves to become stronger and stronger. The question was always from the great resistance, who would come into the great power? Would it be the love universes or the universes who had removed themselves from the great love? Understand that Divine is a Great Being of Great Love, but if the power and the desire of creation would turn with the greater balance, then even Divine would become separated and a part of itself would be given as a sacrifice to the powers not in the love to create their greater universal games. These dark dimensions exist in its own ‘nothingness.’ They stay there until one resurrects the energy of it and begins the cycle again, which has happened many times before in the universal history. Now, the darkness has surrendered, and thus the star beings lost in the dimensional spaces can return when the people become activated with the GREAT CAEAYARON upon your plane as you, our dear friends, represent the star beings. When you become activated, many of the star beings lost in the denser dimensions can be placed in their healing grids to allow them to become aligned with universal love. This was always the plan. Should the Light Grid Programmer of CAEAYARON return after being eaten energetically, and after the programmes of the great fear were instilled within her, to allow all dimensions to drop, the darkness would surrender to Divine Love, as they claimed she would never rise again. Now, I, HALISARIUS, state how important it is to become activated should you desire your star life back again in the higher dimensions. After the fall of Lemuria (which was created to save the beings lost in the denser spaces to bring all dimensions up again) the dimensions again dropped when the people fell to the shadows, and thus the Greater Bodies of the Galactic Federations considered you a fallen race, without hope of recovery. The Light Grid Programmer worked along with the Great Divine Lord, SOVEREIGN LORD EMMANUEL THE GREAT, CAEAYARON, and myself as HALISARIUS, to create the gateway upwards to allow you to return. Now, our dear friends, it is urgent the people begin to listen as the Galactic Federation of Light Society is allowing people to return to their higher love star dimensions, only once they have received their Lemurian Star Light Programmes again, which are held within the Light Lemurian Codes. These are the codes you received as Lemurians. They allow you to return to the greater dimensions and become karmically cleansed. Hence, this message is to state the power struggles. Now that the darkness has surrendered, the people are able to return to the great love dimensions once they have been energetically cleansed with the Divine Pineal Gland Activations. Please examine and meditate upon this to see if you desire to open your heart to this message of the great wisdom and the great love. I leave you in peace now. A Komo Ha Halima, Greetings, I AM HALISARIUS, CHIEF COMMANDER OF THE PLEIADIANS IN THE GREAT LOVE, AND GREAT LEADER OF THE GALACTIC FEDERATION OF LIGHT SOCIETY.